This is really the month of Guild Wars 2. 2 major events occured at the same month resulting in significant increase in the gold price. ArcheAge Gold is slightly increase while currency prices for other games are lower than July. EVE Online and the World of Warcraft price was quite stable in August. ArcheAge gold price in August was slightly higher than last month due to the upcoming patch 2.0 update, Heroes Awaken, in September. New servers, server merger, politics, housing updates and more are going to be introduced for this first time. Since the 2.0 patch update isn't that big, ArcheAge gold price should not have a significant increase. The cheapest was on August 31, 2015 which is 2,000 ArcheAge gold for $42.73 and the most expensive was on August 24, 2015 for $50.00. It was 17.01% different. 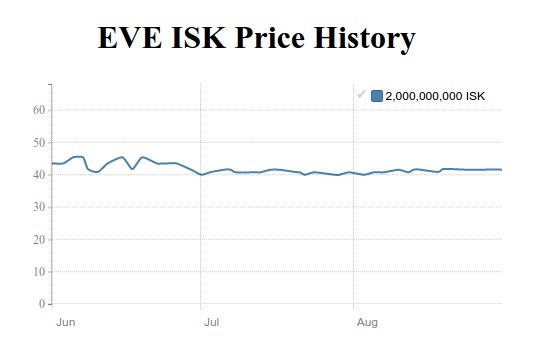 The major Hyperion update on August 26 did not impact EVE Online ISK price at all although it brought significant changes to several game parts including the missions and warmhole exploration. Price in August was almost exact the same as in July. It is expected to be in the range of $41 USD per 2bn ISK in September. The cheapest was on August 1, 2015 which is 2bn EVE ISK for $39.98 and the most expensive was on August 21, 2015 for $41.73 USD. The discrepancy was only 4.38%. FFXIV Gil August price was lower than in July as predicted by our last month price summary although the different rate was not that huge. Gil price was lightly fluctuated on the 3rd week because of the 2-year anniversary celebration, the Rising Event. Since it did only provide the magical moment and not offer any special items, Gil price slowly decreased after the event announcement on August 24, 2015. Final Fantasy XIV Gil should, again, be on a slight decrease in September. The cheapest was on August 18, 2015 which is 5m FFXIV gil for $26.05 and the most expensive was on August 24, 2015 for $28.57. It was 9.67% different. August was a month for Guild Wars 2. Its first game expansion ever, Heart of Thorns, finally had a showcase on August 8 at gamescom 2015. The show was very successful and ended with a sudden 40% boost in Guild Wars 2 price. ArenaNet did not stop only this, they flipped an ultimate card at the end of the month saying GW2 is going F2P. With these 2 major events, Guild Wars 2 Gold price should be increasing continuously even until the end of 2015. 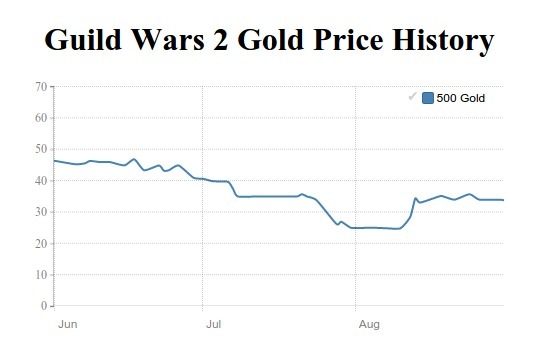 The cheapest was on August 10, 2015 which is 500 GW2 gold for $24.80 and the most expensive was on August 24, 2015 for $35.64. The rise rate was as great as 43.71%. The recent patch 3.3 update last month resulted in price fluctuation on the first two weeks. After that, the price returned to a normal state of ~$34 USD per 10m SWTOR credits, which is $1 USD lower than July. There was a slight increase at the end of the month. September price should not have much change like it happened before in June. The cheapest was on August 3, 2015 which is 10mn SWTOR US Credits for $33.61 and the most expensive was on August 10, 2015 for $39.91. It was 18.74% different. Tera was stepping into a danger position in August. Its gold price have been decreasing steadily since June 2015 but En Masse Entertainment does not have card that could change the whole situation left. The game is already F2P and a new expansion is nowhere to be found. Even the two double-exp weekend events did not have any much impact. It is possible that En Masse Entertainment is giving up hope on Tera and focusing more on mobile games. With this in mind, the decline of Tera Gold price should not stop until a next major event, which is currently nowhere to be found. The cheapest was on August 31, 2015 which is 20,000 Tera Gold for $25.59 and the most expensive was on August 13, 2015 for $28.05. It was 5.49% different. August price on WildStar Online was quite lower than a previous month especially a whooping drop on the third week. If you are planning to purchase some WildStar Gold, this is your golden opportunity before it fully turns into Free to play. Currently WildStar is in a closed beta for F2P transition. 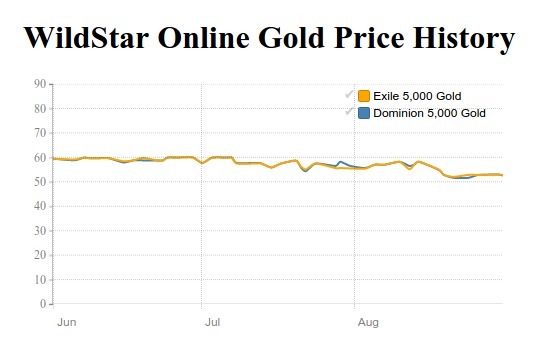 The complete change should occur at the end of September with an expected rise of WildStar Gold price. The cheapest was on August 24, 2015 which is 5,000 gold for $50.47 and the most expensive was on August 10, 2015 for $56.99. It was 12.92% different. Legion expansion news from Gamescom 2015 did not have an impact on WoW US Gold price at all. After the $3 decrease at the end of July, the World of Warcraft Gold price stayed the same for almost the whole month at the rate of $24.95 per 50,000 gold. It only had a minimal rise on the third week but quickly returned to a normal range on following days. WoW Gold price is expected to stay in this rate for a while. The cheapest was on August 26, 2015 which is 50,000 gold for $24.95 and the most expensive was on August 18, 2015 for $26.02. It was as high as 4.29% different.